An outstanding high school science fair project has led to a University of Florida College of Agricultural and Life Sciences freshman being invited to attend the Nobel Prize ceremonies in Stockholm, Sweden in December. UF CALS scholarship recipient Carly Crump won the all-expense paid trip to the Nobel Prize ceremonies for her outstanding performance at the Intel International Science and Engineering Fair, where she presented her project on Dengue Virus transmission. Along with the Dudley R Herschbach Stockholm International Youth Science Seminar Award that granted Crump the trip to Sweden, she also earned Best in Category for microbiology at the ISEF which came with an $8,000 check. 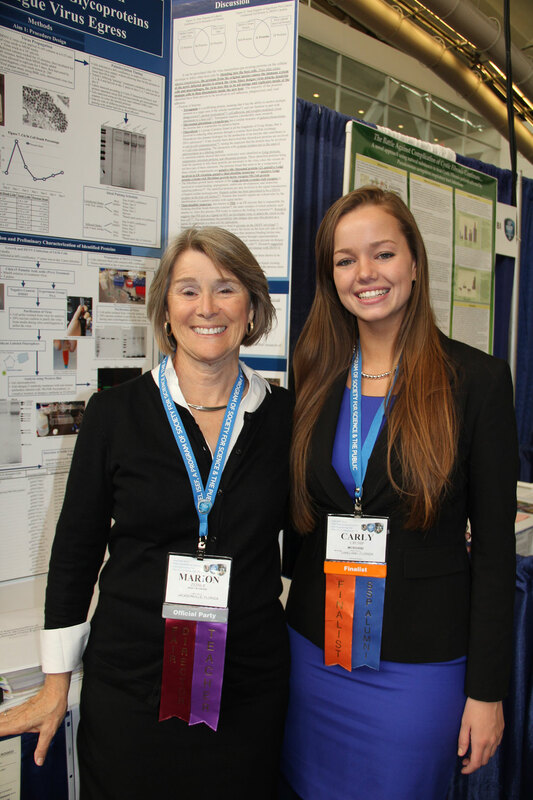 Carly Crump is at the Intel International Science and Engineering Fair with Marion Zeiner, Director of Scientific Research, Chemistry Instructor, Director of Northeast Florida Regional Science & Engineering Fair, Episcopal School of Jacksonville. Not only was she the only U.S. student invited to attend the Nobel Prize ceremonies with the SIYSS program, but Crump will also be presenting her research project to several hundred Swedish high school students and Nobel Prize ceremony attendees; and giving an interview on Swedish National Television while there. As part of the SIYSS program, Crump has also been invited to attend events and dinners where she will have the opportunity to interact with Nobel Prize winners. Crump began her studies at UF this fall as a microbiology and cell science major, after being selected for a 2015 UF CALS scholarship based on her achievements at the State Science and Engineering Fair of Florida in April 2015, where she won first place. Crump also won Best in State at the Junior Science and Humanities Symposium hosted by UF’s Center for Precollegiate Education and Training in January, and also won the microbiology category at the Northeast Florida Regional Science and Engineering Fair in February 2015. Crump has since been recognized as a top young scientist by US News and World Report. As a high school student, Crump was able to complete much of her research on Dengue Virus in labs at Johns Hopkins University and the UF Whitney Laboratory for Marine Bioscience in St. Augustine, Fla. She hopes to begin research again at UF in spring 2016.